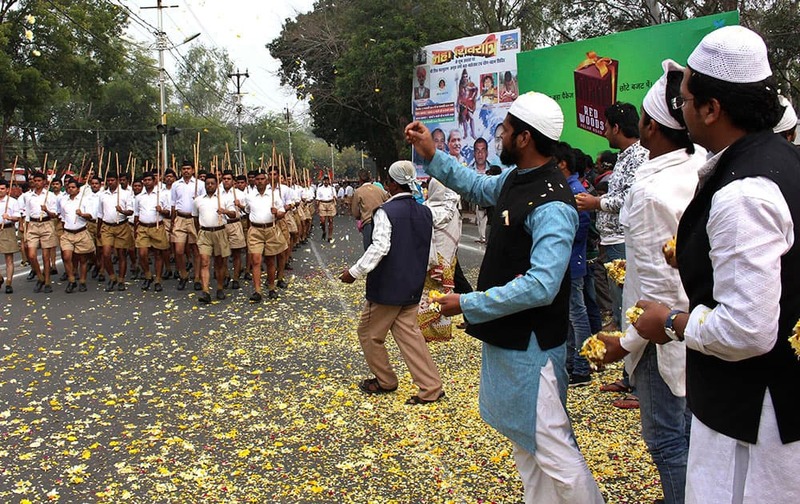 Muslims shower flower petals as volunteers of Hindu nationalist group Rashtriya Swayamsevak Sangh, (RSS), parent organization of the Bharatiya Janata Party (BJP), march on the concluding day of their three-day meeting in Bhopal, India. 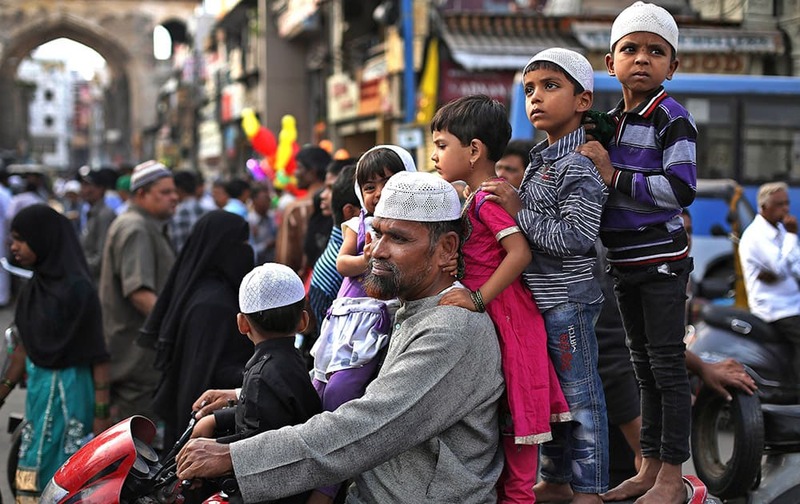 MUSLIM CHILDREN STAND ON A MOTORCYCLE AND WATCH AN ASHOURA PROCESSION IN HYDERABAD. 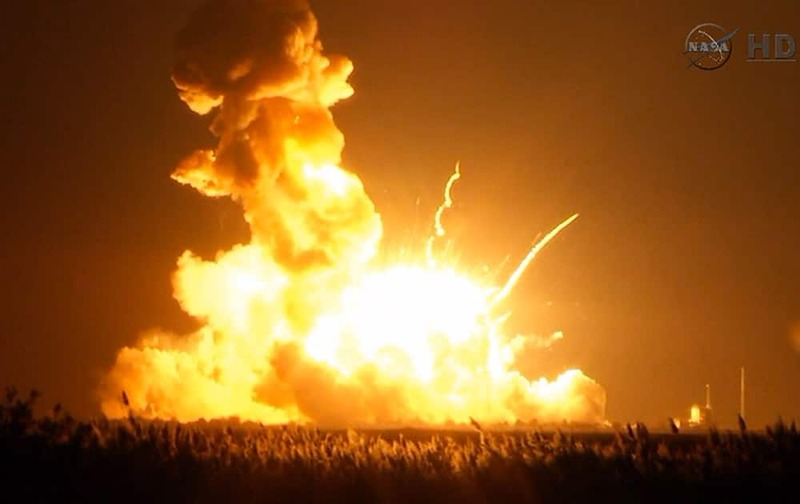 THIS IMAGE TAKEN FROM VIDEO PROVIDED BY NASA TV SHOWS ORBITAL SCIENCES CORP.'S UNMANNED ROCKET BLOWING UP OVER THE LAUNCH COMPLEX AT WALLOPS ISLAND, VA., JUST SIX SECONDS AFTER LIFTOFF. THE COMPANY SAYS NO ONE WAS BELIEVED TO BE HURT AND THE DAMAGE APPEARED TO BE LIMITED TO THE FACILITIES. WOMEN KISS EACH OTHER TO EXPRESS SUPPORT TO THE 'KISS OF LOVE’ CAMPAIGN NEAR THE HINDU RIGHT-WING RASHTRIYA SWAYAMSEVAK SANGH (RSS) HEADQUARTERS IN NEW DELHI. 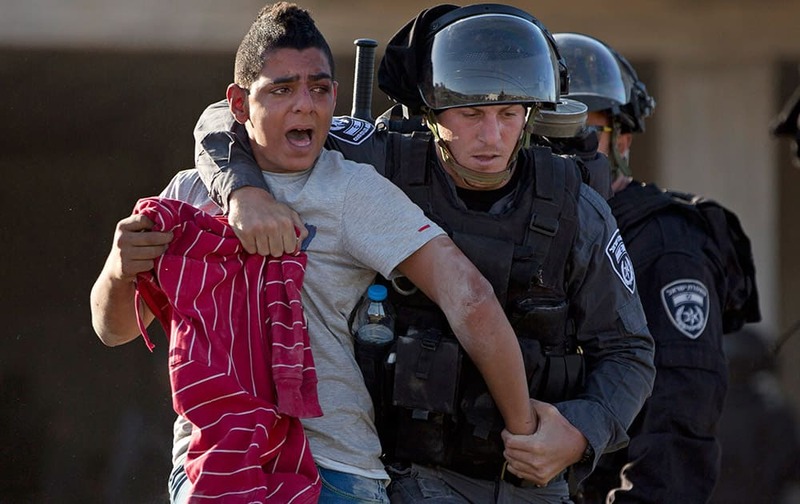 ISRAELI RIOT POLICE OFFICERS ARRESTS AN ISRAELI ARAB PROTESTER DURING A PROTEST OF THE FATAL SHOOTING OF A 22-YEAR-OLD ARAB ISRAELI WHO WAS SHOT DEAD OVER THE WEEKEND AS HE APPEARED TO BE WALKING AWAY FROM A POLICE CAR, IN THE ARAB VILLAGE OF KFAR KANA, NORTHERN ISRAEL. 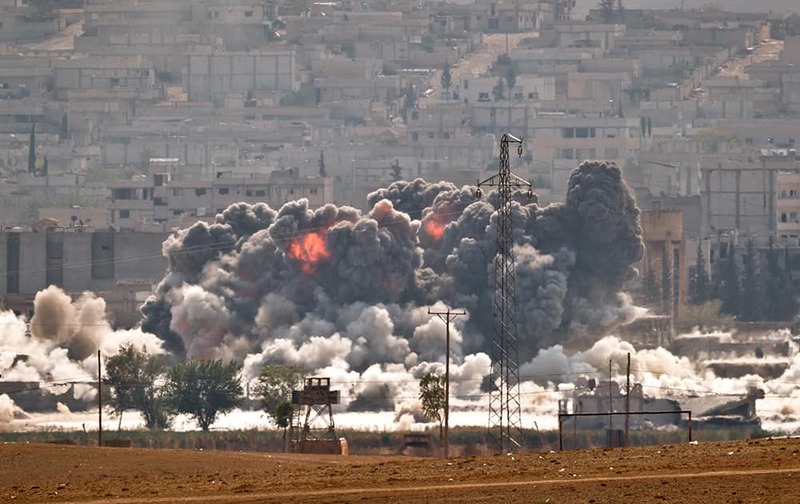 SMOKE AND FLAMES RISE FROM AN ISLAMIC STATE FIGHTERS' POSITION IN THE TOWN OF KOBANI DURING AIRSTRIKES BY THE US LED COALITION SEEN FROM THE OUTSKIRTS OF SURUC, NEAR THE TURKEY-SYRIA BORDER. KOBANI, ALSO KNOWN AS AYN ARAB, AND ITS SURROUNDING AREAS, HAS BEEN UNDER ASSAULT BY EXTREMISTS OF THE ISLAMIC STATE GROUP SINCE MID-SEPTEMBER AND IS BEING DEFENDED BY KURDISH FIGHTERS. 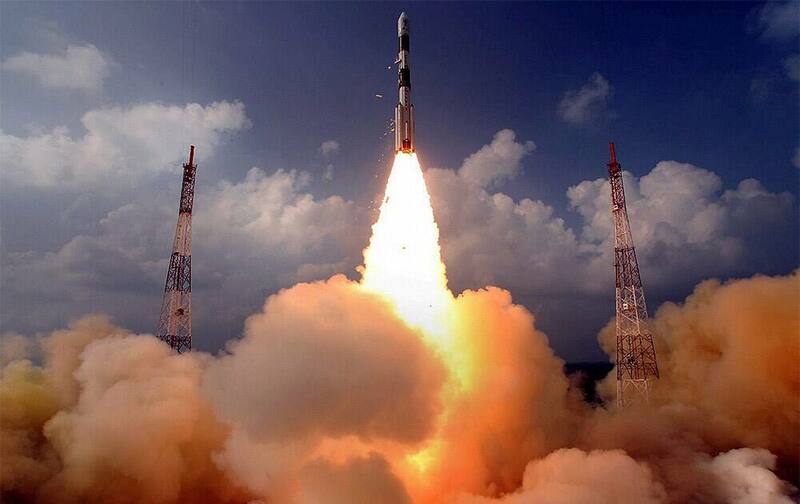 INDIA SUCCESSFULLY LAUNCHED ITS FIRST MISSION TO MARS ON BOARD PSLV C25 FROM SATISH DHAWAN SPACE CENTRE (ISRO) AT SRIHARIKOTA IN ANDHRA PRADESH. 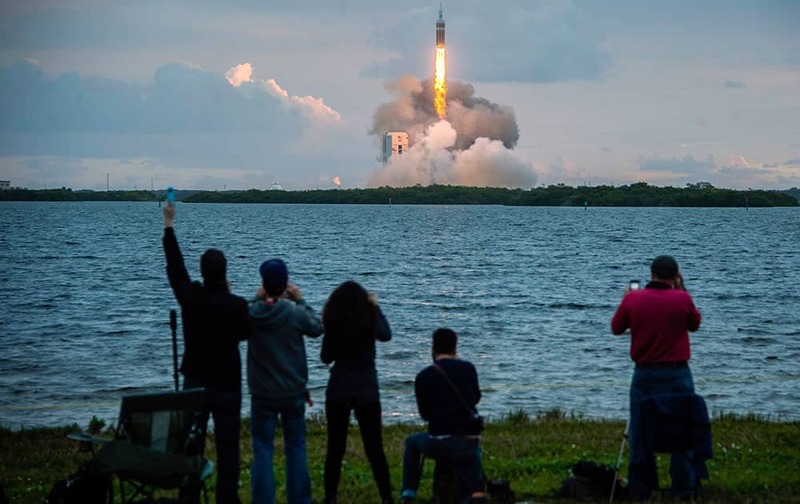 THE MISSION IS EXPECTED TO REACH MARS ORBIT. 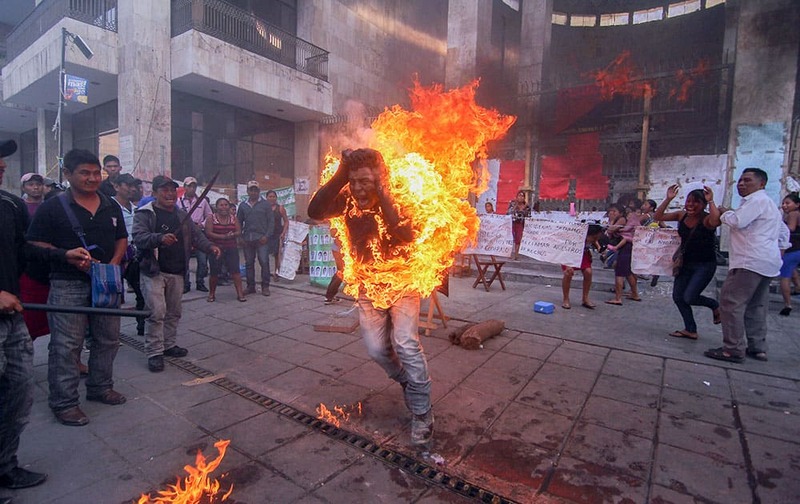 In this Dec. 5, 2014 file photo, farmer Agustin Gomez Perez runs engulfed in flames after he was lit on fire as a form of protest outside the Chiapas state legislature in Tuxtla Gutierrez, Mexico. Perez, 21, was demanding the release of his father, indigenous leader Florentino Gomez Giron, who was arrested last year on charges stemming from a series of demonstrations in 2011 that turned violent. 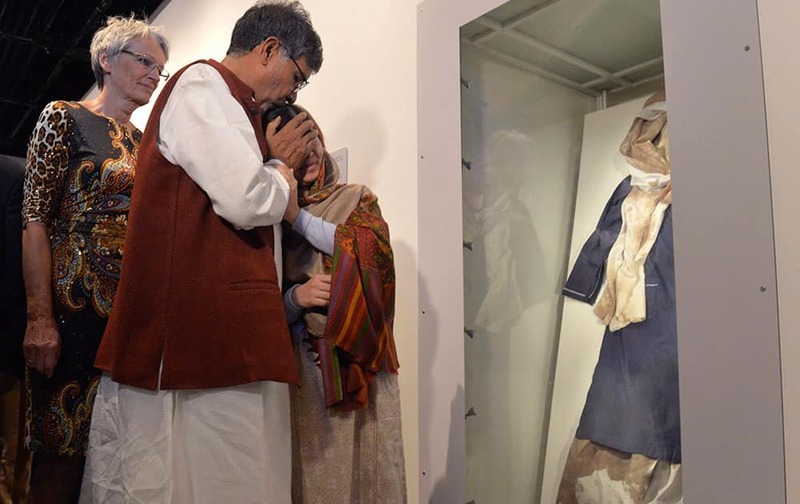 Prize winners Kailash Satyarthi and Malala Yousafzai, right, look at Malala's blood stained school uniform at the opening of the Nobel Peace Prize exhibition at the Nobel Peace Center in Oslo, Thursday, Dec. 11, 2014. 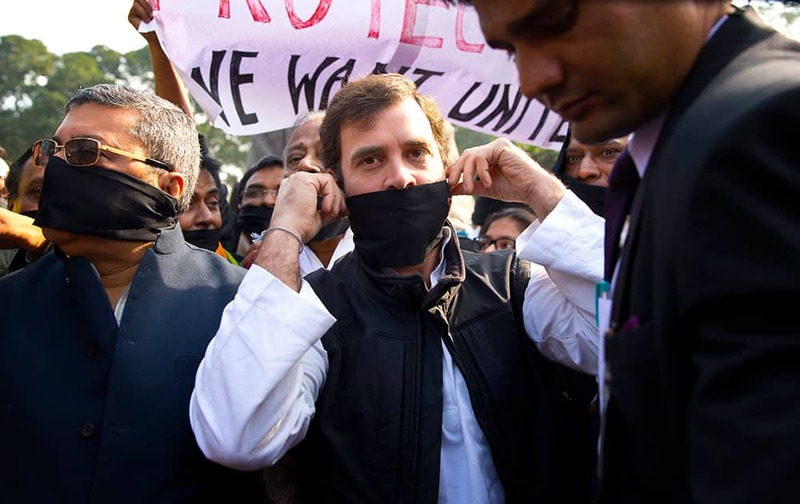 India's opposition Congress party Vice-President Rahul Gandhi, center, covering his mouth with a black cloth, participates in a protest outside the Indian Parliament in New Delhi, India, Friday, Dec. 5, 2014. 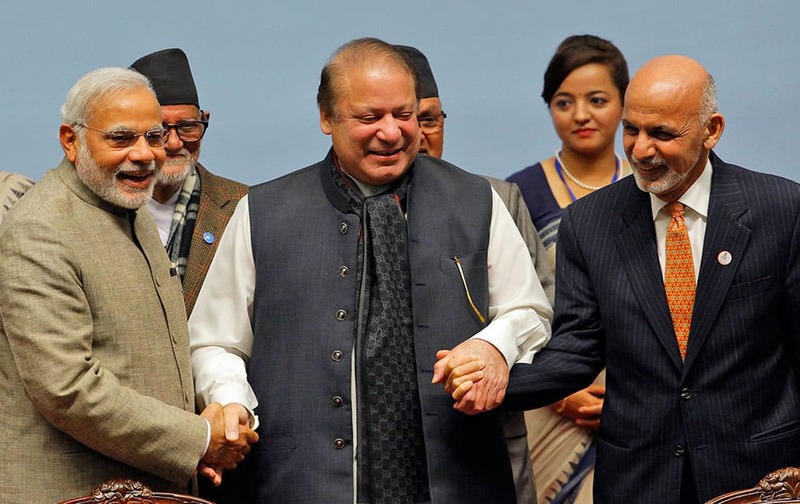 Pakistani Prime Minister Nawaz Sharif, center, holds hands with Indian Prime Minister Narendra Modi, left, and Afghanistan President Ashraf Ghani during the closing session of the 18th summit of the South Asian Association for Regional Cooperation (SAARC) in Katmandu, Nepal, Thursday, Nov. 27, 2014. 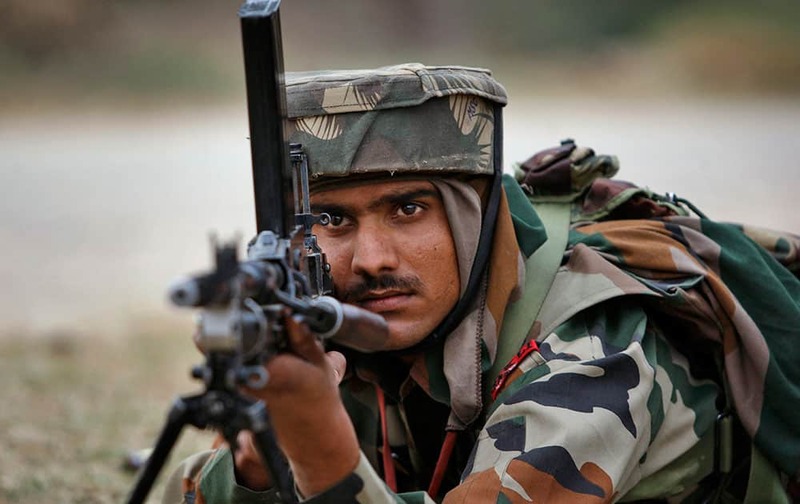 An Indian Army soldier takes position during an encounter with armed suspected militants at Pindi Khattar village in Arnia border sector, 43 kilometers (27 miles) south of Jammu, India, Thursday, Nov. 27, 2014. 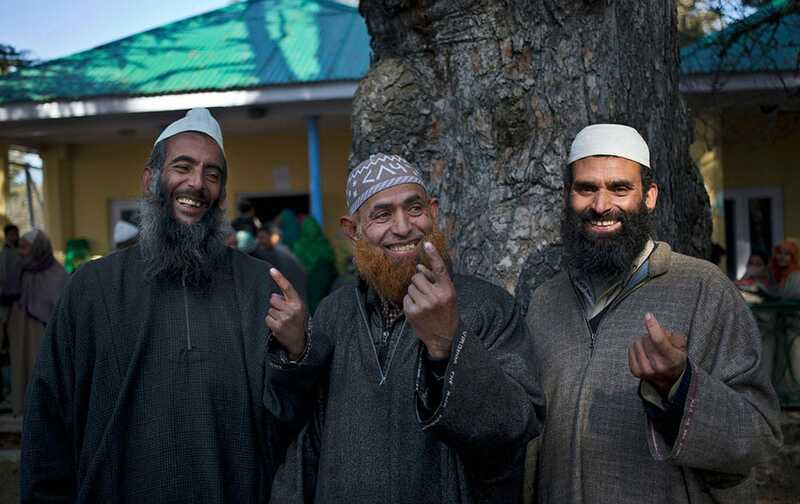 Spectators cheer as the United Launch Alliance Delta 4-Heavy rocket, with NASA’s Orion spacecraft mounted atop, lifts off from the Cape Canaveral Air Force Station Friday, Dec. 5, 2014, in Cape Canaveral, Fla.
Kashmiri Muslim men show the ink mark on their index fingers after casting their votes during the third phase polling of the Jammu and Kashmir state elections in Monu, about 25 kilometers (15 miles) south west of Srinagar, India, Tuesday, Dec. 9, 2014. Bollywood actress and Girl Rising ambassador Priyanka Chopra, left, whispers into the ear of fellow ambassador and Hollywood actress Freida Pinto at the launch of Girl Rising: Engage India, in New Delhi, India, Saturday, Nov. 29, 2014. 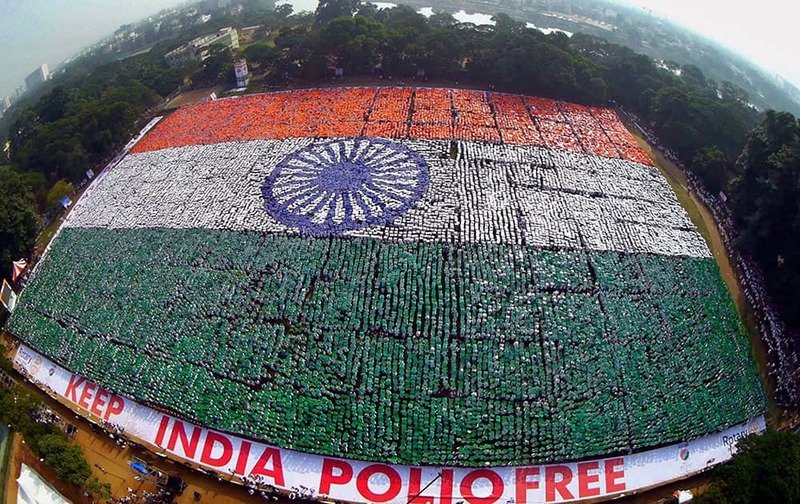 In this Sunday, Dec. 7, 2014 photo, an aerial picture shows the Indian national flag formed by volunteers seeking to set a Guinness Record for the largest human flag formation at Nandanam YMCA ground in Chennai, India. In this June 7, 2014 file photo, 17-year-old Miguel Chusqui grimaces in pain as he is lashed by a "rondero," a member of a citizen vigilante group known as a "ronda urbana,” or urban patrol, in Cajamarca, Peru. Chusqui was sentenced to five lashes for stealing a laptop. 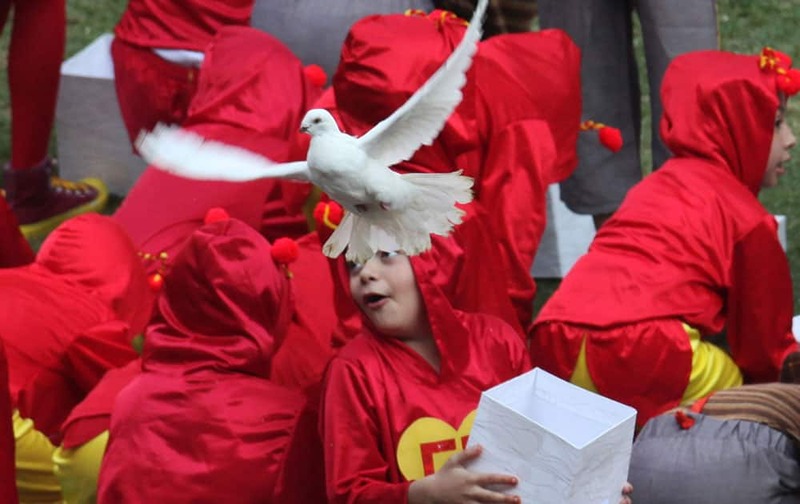 In this Nov. 30, 2014 file photo, children dressed as "El Chapulin Colorado" and "El Chavo del Ocho" characters, release white doves during the memorial service of Mexican comedian Roberto Gomez Bolanos at the Azteca stadium the in Mexico City. 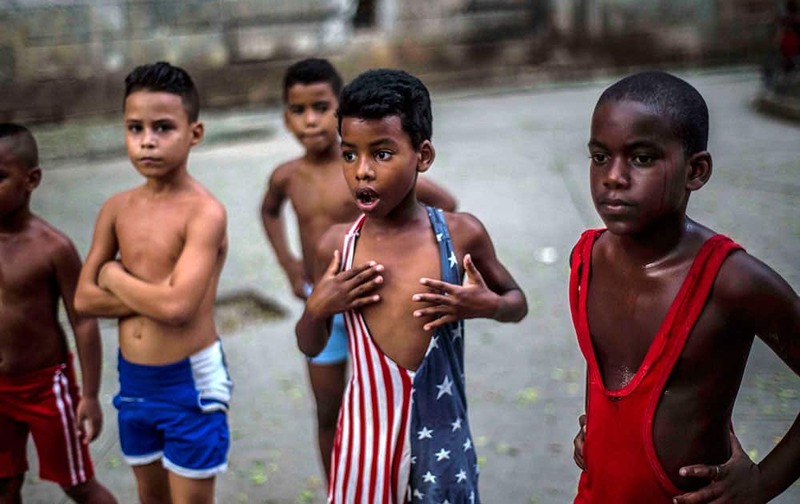 In his Oct. 15, 2014 file photo, 8-year-old Yodimiler Arias, along with fellow wrestlers, listen to instruction from their teacher, in a park in Old Havana, Cuba. Yodimiler's mother said the U.S. flag motif wrestling suit was sent by her cousin in the United States. 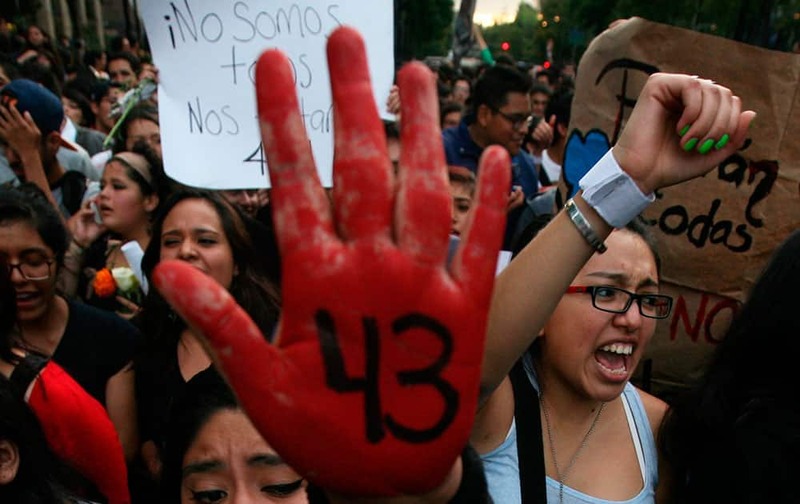 In this Oct. 22, 2014 file photo, demonstrators protest the disappearance of 43 students from the Isidro Burgos rural teachers college, in Mexico City. 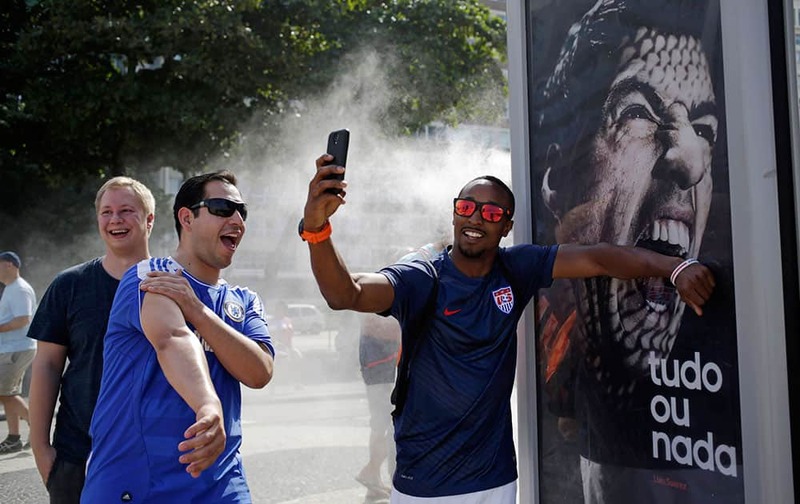 In this June 26, 2014 file photo, a U.S. soccer fan pretends that Uruguay's soccer striker Luis Suarez is biting him as he takes a selfie next to an Adidas advertisement featuring Suarez near Copacabana beach in Rio de Janeiro, Brazil. 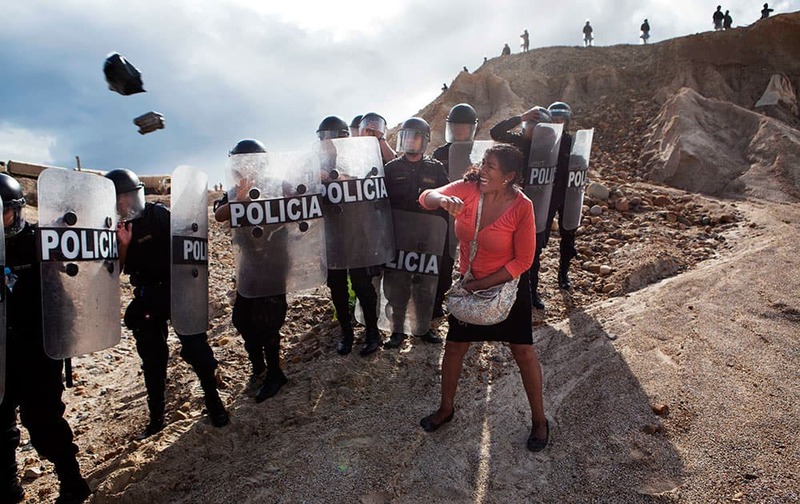 In this April 28, 2014 file photo, a woman throws a rock and a bag at police blocking her from getting home in the Huepetuhe district of the Madre de Dios region of Peru. 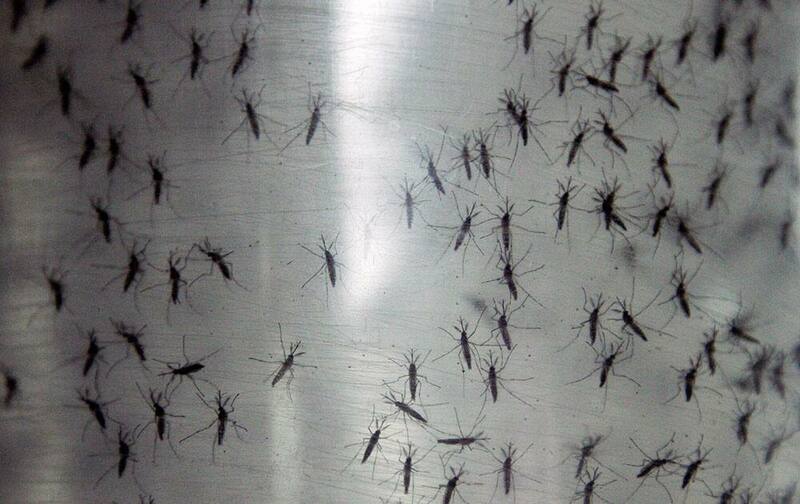 In this Sept. 25, 2014 file photo, containers hold genetically modified aedes aegypti mosquitoes before being released in Panama City. 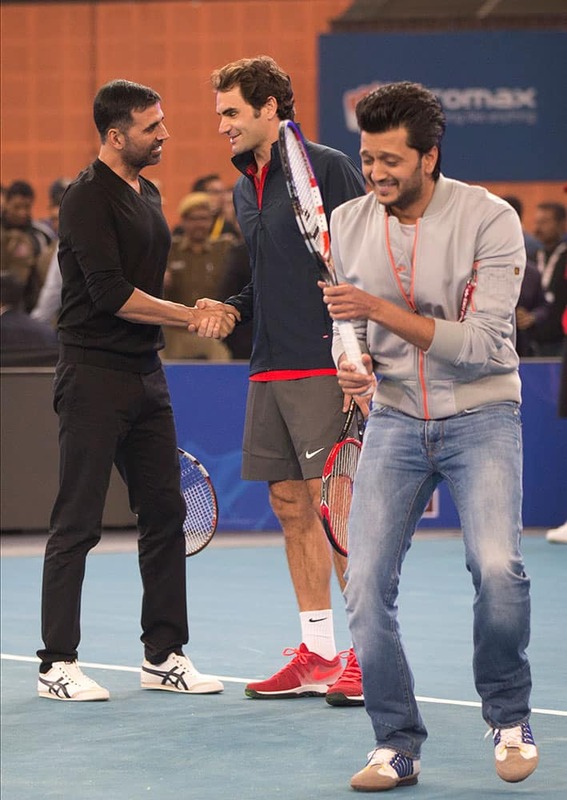 Micromax Indian Aces player Roger Federer, shakes hands with Indian Bollywood actor Akshay Kumar, left, as actor Ritesh Deshmukh passes by during a match on the sidelines of the International Premier Tennis League, in New Delhi, India. Micromax Indian Aces players Roger Federer, left, talks to Sania Mirza after scoring a point against DBS Singapore Slammers's Bruno Soares and Daniela Hantuchova in the mixed doubles match, during the International Premier Tennis League, in New Delhi, India, Sunday, Dec. 7, 2014. 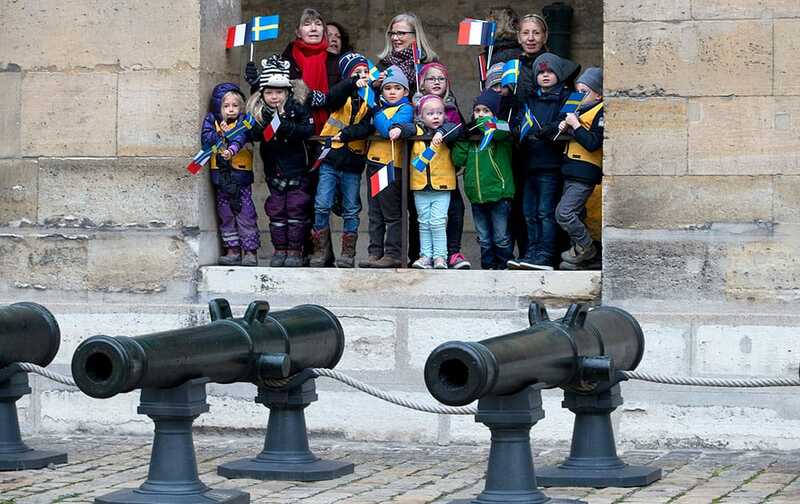 School children of the Paris Swedish school attend a military ceremony with Sweden's King Carl XVI Gustaf and Queen Silvia at the Invalides in Paris, Tuesday, Dec. 2 ,2014. 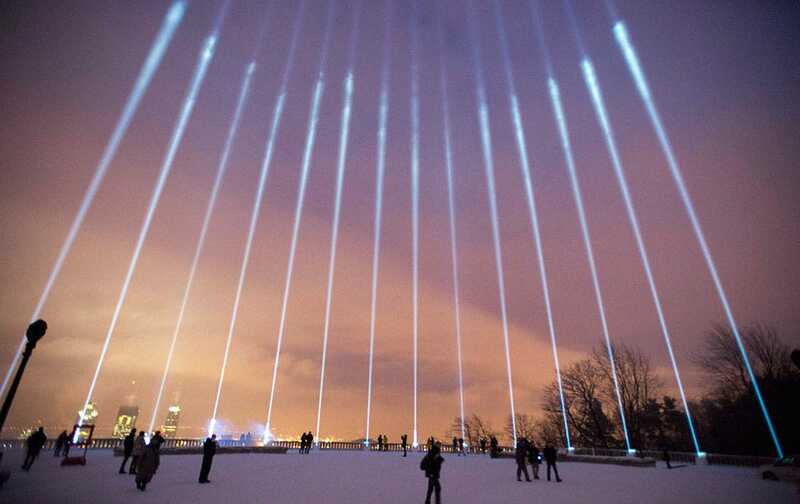 Fourteen lights shine toward the sky during a ceremony on Mount Royal to mark the 25th anniversary of the Polytechnique massacre Saturday, Dec. 6, 2014 in Montreal. 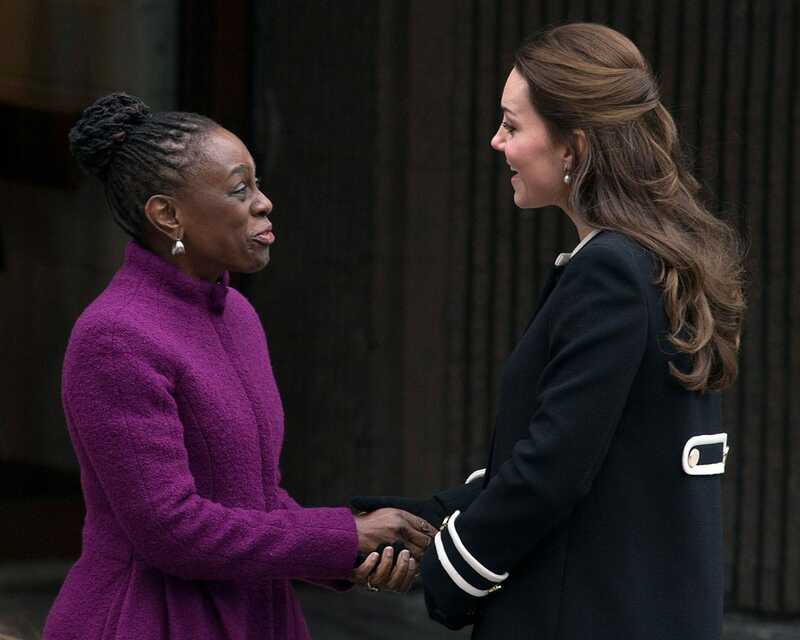 New York City first lady Chirlane McCray, left, and Britain's Kate, Duchess of Cambridge, shake hands outside the Northside Center for Child Development, Monday, Dec. 8, 2014, in New York. In this Sept. 19, 2014 file photo, U.S. singer Miley Cyrus performs in concert during her Bangerz Tour in Mexico City. Miss South Africa Rolene Strauss is crowned Miss World 2014 by last year's winner Megan Young, during the finale of the competition at the ExCel centre in London, Sunday, Dec. 14 2014. In this Nov. 26, 2014 photo, volcanic smoke billows from Mount Aso, Kumamoto prefecture, on the southern Japanese main island of Kyushu. 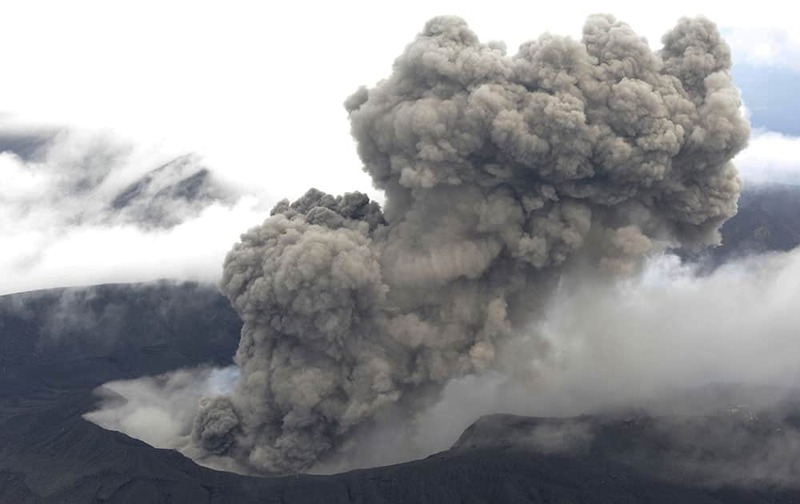 The volcano is blasting out chunks of magma in the first such eruption in 22 years, causing flight cancellations and prompting warnings to stay away from its crater. 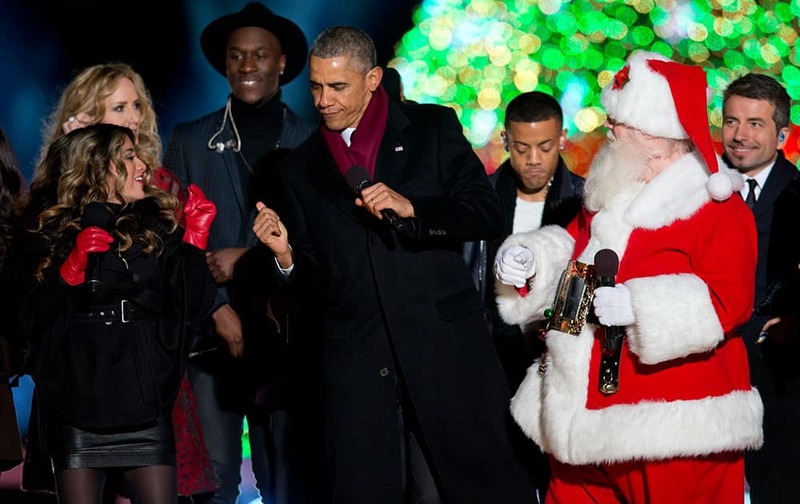 President Barack Obama dances on stage with Santa, members of Fifth Harmony, left, Chely Wright, Nico & Vinz and a member of The Tenors, behind, during the National Christmas Tree lighting ceremony at the Ellipse near the White House in Washington, Thursday, Dec. 4, 2014. First lady Michelle Obama hugs a Capital City Public Charter School senior after speaking at Capital City Public Charter School in Washington, Friday, Dec. 5, 2014, at the second annual College Application March, part of her Reach Higher initiative. 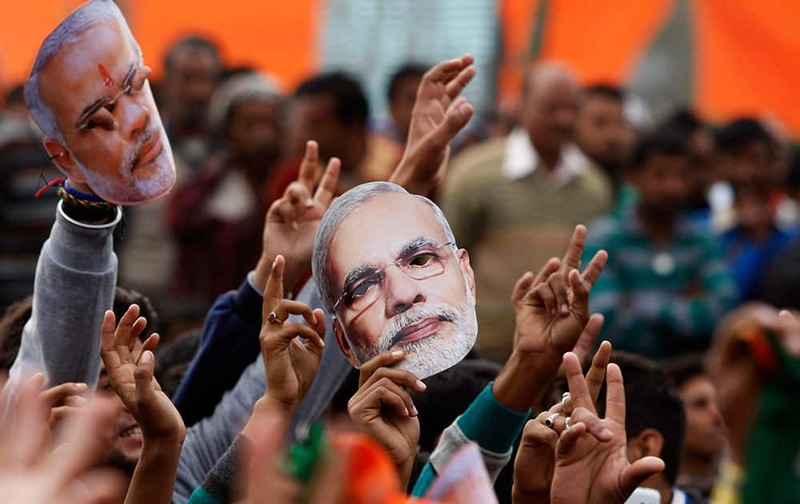 Supporter of India's ruling Bharatiya Janata Party (BJP) hold up masks of Prime Minister Narendra Modi during an election campaign rally in Kathua, about 90 kilometers from Jammu, India, Saturday, Dec.13, 2014. 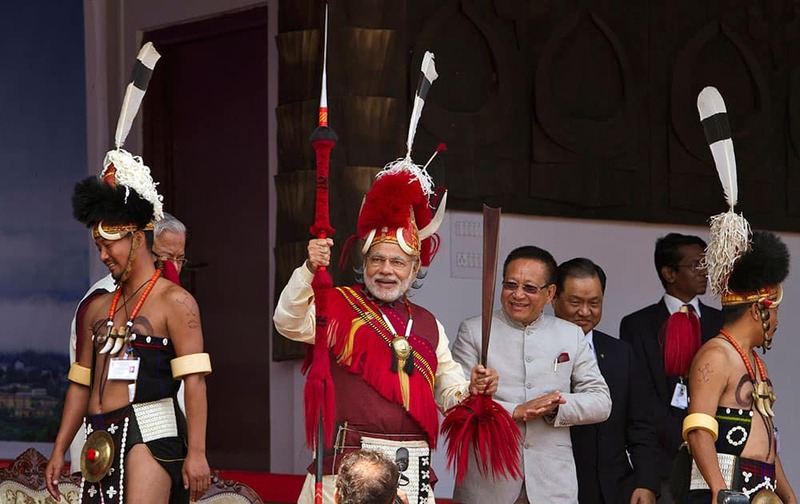 Indian Prime Minister Narendra Modi, center, in traditional attire holds a Naga spear and a sword during the inaugural ceremony of the Hornbill Festival in Kisama village in Nagaland, India, Monday, Dec. 1 2014.